Need more information about booking Home 8569692 ? Nautica Vista is a 3-bedroom, newly renovated, luxury apartment that sleeps 6. A surprise awaits you and you enter this hidden jewel, perched above Clifton 4th beach, with wide sweeping views over the Atlantic ocean, this 2 storey apartment, features an open-plan, fully equipped kitchen with a breakfast bar, an eight-seater dining table, comfortable lounge with satellite TV, a furnished outside area with BBQ facilities and outstanding views. 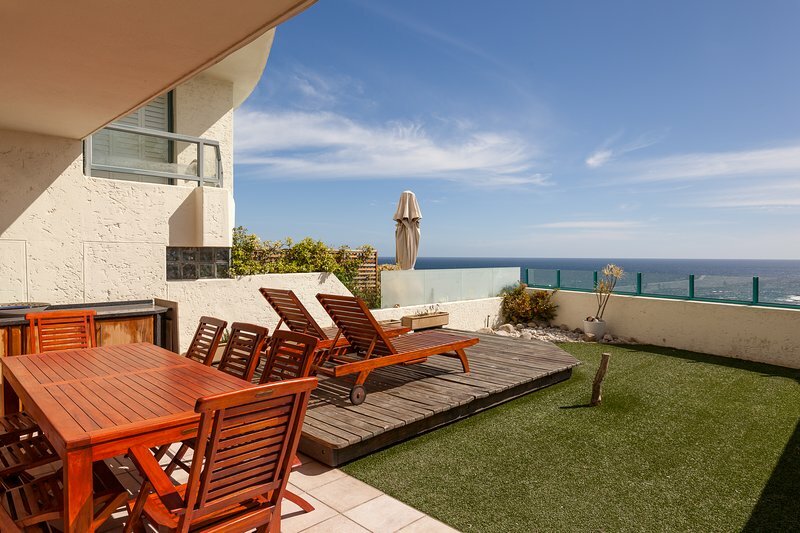 Guests can revel in an abundance of great attractions in and around the area, such as the superb beaches, the famous Lion's Head, and the numerous charming eateries along the Camps Bay shoreline. We do not allow functions of any sort to take place at this property. Estimated price per night based on a weekly stay. Owner fees of £389.00 per stay may apply. Enter your dates to see the total cost.